Smoked salmon ideas? Check out this new idea where you use smoke salmon as spread. 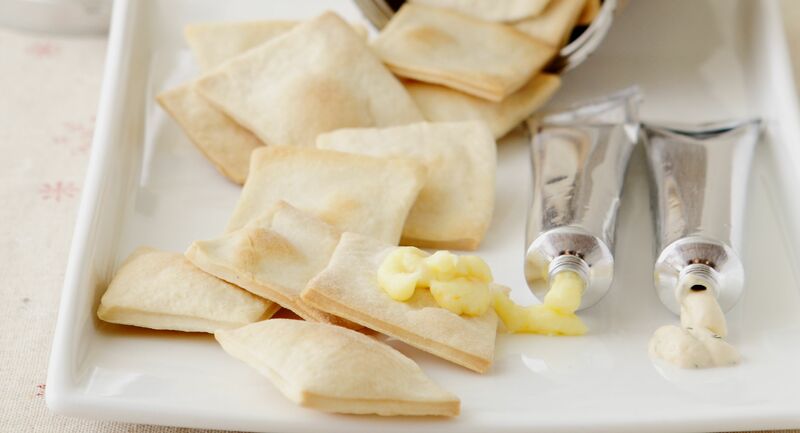 Bake a batch of crackers and present them along with tasty toppings in a squeeze tube. Your buddies will love this cool idea. This recipe is courtesy of Crystal Chan of Patisserie Rui and was first published in Flavours magazine. Dissolve salt in water. Make a well in the flour and pour in the salted water. Mix into a dough, then add in melted butter; knead until smooth. Wrap and chill for about 2 hours. Roll out the dough as thinly as possible and cut into desired shapes. Preheat the oven to 180°C. Arrange the crackers in a baking tray lined with greaseproof paper. Bake at 170°C for about 15 minutes, or until the crackers are lightly browned. Combine all ingredients for orange cream cheese spread in a blender. Blend until smooth. Repeat for smoked salmon cream cheese spread.